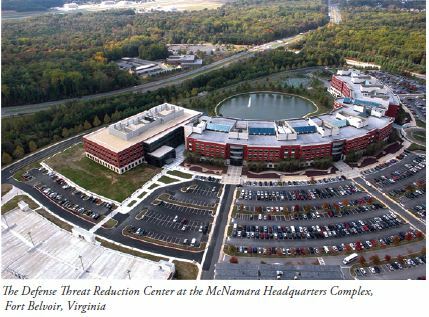 A second document describes an assessment by the Defense Special Weapons Agency acting alone this time in a vulnerability assessment of the Fort Detrick area as a whole. This assessment was conducted in early 1998 and USAMRIID was included among the facilities assessed. (USAMRIID Vulnerability 1998 pdf). This document is more heavily redacted than the 1996 document and appears to be more focused on the physical aspects of the facilities, but sabotage, criminal activity and terrorism were listed among the threats evaluated, so it seems likely that at least part of the 1998 work addressed the issues from 1996 listed above. At Dugway, which unlike USAMRIID did make anthrax powder, the FBI examined who was present at work and during what hours on the days before the anthrax was postmarked. The bureau concluded that none of Dugway’s researchers could have flown to New Jersey and back during their windows of opportunity. The BACUS facility was built by DTRA, and now we have DTRA personnel visiting USAMRIID in 1996 and 1998 to assess its security weaknesses. In 1996, they brought up the possibility of an internal theft of biological materials that could be grown into weapon material. They also noted that there is a central list with an inventory of material that could turn into threats. By the time they returned in 1998, Bruce Ivins’ RMR-1029 flask would have been on that list, as RMR-1029 was produced in 1997 (see this post for details). So now we have Project BACUS personnel with the appropriate facility for producing and weaponizing the material used in the attacks and likely with access to inoculum that would result in the genetic signature seen in the actual attack material. That takes care of means and opoortunity. How about motive? Take a look at the photo at the top of this post showing the huge facility that DTRA was able to build in 2005. Although the 9/11 attacks likely would be seen as the primary force behind this sort of investment in DTRA in this time period, the importance of the anthrax attacks for the ascendance of DTRA shouldn’t be overlooked. Once we get into the concept of a Defense agency being involved, we then see the logic of the targeting. Tom Daschle and Pat Leahy were outspoken critics of the Patriot Act and their mailings went out just after publication of their criticism. Robert Stevens becomes an interesting early target because he was involved in publication of an unflattering photo of Jenna Bush in the National Enquirer. The location of DTRA in suburban Washington places a large number of DTRA personnel within the same distance of the critical Princeton mailbox as Bruce Ivins. At least some DTRA personnel in the DC area have enough knowledge of anthrax that this 2008 conference (pdf) on the impact of an anthrax “event” had five DTRA attendees. It is not difficult to envision how the attack letters could have been prepared at the Project BACUS site at Dugway the Nevada Test Site and then sealed into a non-permeable pouches for transport to Princeton, where the pouches could have been slit with the letters sliding into the mailbox. Of course, all of this “evidence” against DTRA is merely circumstantial. But to me, it is a circumstantial case that is far stronger than the FBI’s circumstantial case against Bruce Ivins.